I had previously covered Secunia PSI (software updates checker with focus on security) and mentioned its online version. Secunia Online Software Inspector is online app that runs on Java and checks common software for outdated and insecure versions. OSI is web page that loads unobtrusive Java applet and scans computer for insecure software. Default fast scans seems to simply pull information from list of installed programs in Windows, while optional extended scan actually goes through files on root partition. Skype, WinAmp and few more apps with no clear link to how they landed on the list. There is also option of email subscription to receive notices about updates of software on the list (just subscribe to Appnews instead :). While OSI performs quickly, efficiently and completely in browser it feels very limited by miniscule amount of software it detects. 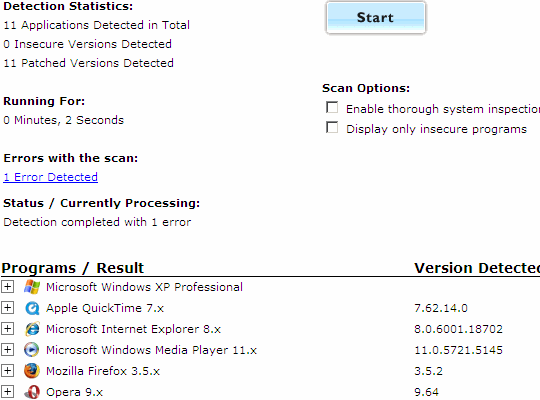 It will sure catch outdated browser but comparing to other Secunia scanners it feels like a toy near real software. Good for quick check, too limited for anything serious.